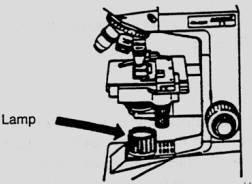 If you want to reserve a microscope and boxes with slides, please contact Dr. Michael Hortsch. You will need to sign a loan agreement to obtain a locker key and you will be responsible for the slide collection. The slide boxes and the microscope may not be removed from the laboratory. You will be charged $8 for any broken slide. Before putting a slide on the stage - turn on the illumination & set the light to a comfortable level. IT IS NOT NECESSARY to use the light at maximum - to do so can be very tiring to the eyes. 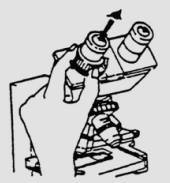 Rotate the 4X objective into position. Gently rotate the left EYEPIECE diopter ring such that the marks (usually dots or hash marks) on the diopter ring and the eyepiece tube line up. Adjust interpupillary distance so right & left images merge into one. If you wear glasses for mild near- or far-sightedness, you generally won’t need them while looking through the scope –the microscope can defocus or overfocus the image as needed. However, if you have astigmatism or a heavy prescription, you may find it necessary to wear glasses –just keep in mind that the oculars may scratch your lenses, particularly if they are plastic. Be sure your slide is clean. Be sure the oculars are clean - USE LENS PAPER ONLY! Now, place a slide on the stage, COVERSLIP UP! Raise the Condenser upward toward the slide GENTLY! - as far as it will go. Using coarse knob, focus using the 10x objective. Then adjust with FINE FOCUS knob on SMALLEST detail visible in the field. Now position 40x objective & adjust FINE FOCUS knob - you SHOULD NOT NEED TO TOUCH COARSE knob. First - close LEFT EYE – then focus the image for your RIGHT EYE using fine focus knob. Now, close right eye and using ONLY DIOPTER RING adjust for LEFT EYE. 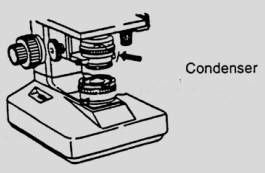 If you have performed these steps: for the remainder of the current lab - it should only be necessary to adjust the FINE focus knob - regardless of the slide or objective that you use. BE AWARE! You share this locker with other medical (M2) and graduate students and these scopes are subject to a lot of jostling around.THEREFORE, you would be wise to follow this method of scope adjustment at the beginning of each lab - if you want to obtain the greatest value for each lab.